Zhineng Qigong is a form of training to improve and develop the physical body and mentalbody. “Zhi” means intelligence or the potential of the brain to understand and act into the outside world. “Neng” refers to both physical and mental abilities. Lift Chi Up Pour Chi Down is part of the teachings of Zhineng Qigong. It is a gentle form of moving meditation that works together on the whole body, mind and spirit. Based on a holistic view of life, with Qigong you can achieve change by focusing the consciousness inward, and through work on your consciousness and body movement. While the first and most obvious benefits of Qigong are an improvement in physical health and a sense of well-being, its practice also has a powerful mental effect. Daily practice increases vital energy and unblocks the energy channels of the body and improve health and awareness. Dancing QiGong means your body resonating with free movements in empathy with music and the slow melody of sounds. Moving freely into the space, discovering spontaneous movements of the energy body. Energy flows as much you do. The practice of QiGong dancing is a pleasure not just for the physical body, as we shake, dance and create ability for the body in many of Chinese posture, as well for the faculty to create new imagination thinking on the effect of the energy flow and self healing. We should really be thankful for our body that carries all day long all our mental structures that brings as on unbalanced situation, just like emotional breakdowns or simple emotional en structured diseases. QiGong dance harmonize internal organs and external energy channels, create immediate effect on the body level. The physical body recovers must faster when is energized en disease immediately recover. The emotional en mental body are going easily towards harmony levels, when in Qi state. Driven from Shen Qi Palace, observing and by exploring the inner peace the intelligent movement start to dance. Qi follows the thoughts, healthiness disappears and your hands became Qi hands. 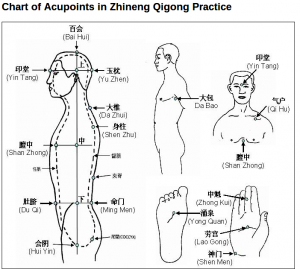 The Chen Qi method is a method to stimulate and mobilize the internal qi and unify qi in the entire body.